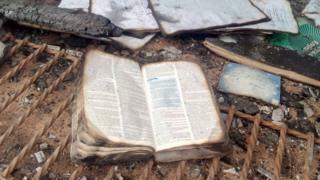 Why are Kenyan schools being torched? More than 100 government secondary schools in Kenya have been set alight this year - with many of the arson incidents being blamed on students. The reason behind these attacks it still not clear, but it comes amid a government crackdown on exam cheating and other reforms to the education sector. Some schools have had to shut down completely meaning that more than 6,000 students have been sent home. "We were in class when we heard some of our colleagues shouting from outside, so we rushed out to find out what was happening," a pupil from St Theresa Bikeke Girls Secondary School, who asked to remain anonymous, told the BBC's Muliro Telewa. "We saw our dormitory on fire," she told our reporter after being sent home. "We grabbed fire extinguishers which were there, we even collected some from the nearby boys' school and with the help of our teachers who were around at the time, we managed to put out the fire. "I lost everything in the fire, like books, files, my clothes and bedding." She said she did not know who started the fire. The arsonists were not willing to be named or be officially interviewed by the BBC. But some of those who told the police they were responsible for the fire at Tabaka High School spoke to our reporter about what had prompted them to take action. The boys said that they had met pupils from a neighbouring school who had told them they were already on holiday as their school had been burned down. So the Tabaka students, who said they felt under stress because of their heavy workload, thought they would be able to get time off school if they burnt some of the buildings. As part of government reforms, the August school holiday has been shortened by two weeks, and students are not due to break up until 12 August. "At just after midnight we received a call from the school and were told there was a fire. I rushed to the school with other parents and found that one dormitory was burning," Moses Ongesa Ombari, whose child goes to Tabaka High School, told our reporter. "The teachers on duty and the police had already done their part and were able to put out the fire. "According to the investigation in the morning we found that the fire was started by students. And when they were questioned they admitted that they did it. "When you speak to them they don't have good reasons for why they set fire to the school. "As a parent, I think that some of them do it because they fell like they want to be known, for the fame. Others are doing it because of ignorance, and some are doing it because of drugs. "The idea that this is a protests against a high work load and a lack of holidays is silly because they come to school to learn. "For me the solution is the return of the cane. I went to school with it and you were caned when you messed up in school. That is the only medicine. "They have been given freedom now and they don't want to be caned because they know their rights. "Those rights are the ones which are making the students lack discipline." "One thing which is very unfortunate is that teachers are overwhelmed by of the numbers of pupils. The teacher-pupil ratio ratio is skewed to the advantage of the students," Akello Misori from the Kenya Union of Post Primary Teachers told the BBC's Focus on Africa radio programme. "The guidance and counselling departments of the schools are also under pressure, because the teachers who handle these types of responsibilities have a lot of work on their hands. "There may also be a political element. "The school pupils all come from the local area and bring local issues to the school. Therefore there are students who sometimes propagate the political interests of their village. "If the leadership of the school is not from their area then some feel they do not benefit from the school." In giving evidence to a Senate committee last week, Kenya's Education Minister Fred Matiang'i also appeared to blame local disputes and bad school management for some arson cases. "The management of schools has been hijacked by local politics and clanism. Are people burning schools... so that documents and records are burned in offices to avoid accountability?" he speculated. "That's why I'm saying the challenges we have are related to institutionalised impunity." He argued that this would limit contact between students and outsiders when they might get access to leaked exam questions. Mr Matiang'i now seems to think it is some teachers were generally unhappy about ongoing reforms, which has also seen the second term lengthened and the third term shortened. When senators questioned him about why he made unscheduled visits to schools, he became more pointed in his criticism. "The question you need to ask and answer yourself is: 'Who is opposed to my going to schools?' It's not the parents; it's not the children. Who is opposed and why are they opposed to my going to schools?"